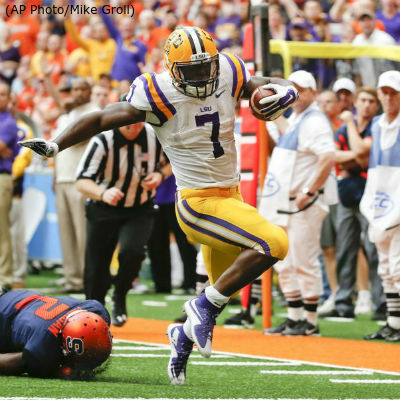 Item: When Syracuse and LSU meet Saturday night (7:00 p.m. ET / ESPN2) for the fourth game of their all-time series, it will mark the first time SU has played in Baton Rouge, with the accompanying color and pageantry that comes from a Saturday night kickoff at 102,000-plus seat Tiger Stadium, a.k.a. Death Valley. But it’s not the first time the programs have met in the Tigers home state. 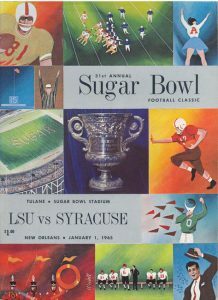 That was the 1965 Sugar Bowl, played on New Year’s Day in New Orleans, an eventual come-from-behind LSU victory. A few months before LSU’s visit to the Dome during the 2015 season to kick off this about-to-expire, two game, home-and-home series, we wrote about the historical aspect to the 1965 Sugar Bowl game, the first meeting between the schools. One, a traditional football program from “the East,” as described by the Sugar Bowl committee in extending an invitation to Ben Schwartzwalder’s Orangemen following a 7-3 finish to the 1964 season, and a southern power from the SEC with an all-white roster playing in the segregated pre-1964 era in the United States, which had not faced an opposing team that had African-American players on its roster. That changed on Jan. 1, 1965 when LSU met Syracuse at long demolished Tulane Stadium in the Sugar Bowl Classic, weeks after the U.S. Supreme Court ruled that Louisiana’s state law prohibiting racial integration at public entertainment and athletic events was unconstitutional. The bowl game invite for the ‘64 team was the first for Schwartzwalder in two seasons, and it was offered despite a season-ending loss at home to West Virginia, mainly because of two players, Floyd Little and Jim Nance. The Orange duo had rushed for a combined almost 1,800 yards, and 25 touchdowns or 14 more TDs than Charlie McClendon’s Bengal Tigers had as a team during their 7-2-1 regular season. They would also become the first African American players to face a LSU team. 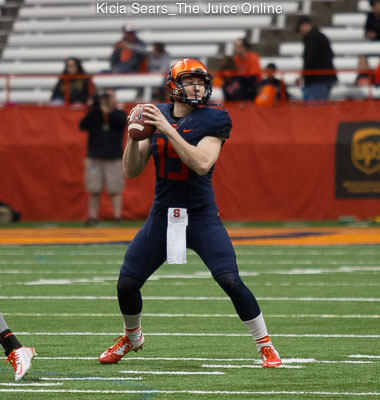 Syracuse started off strong on New Year’s afternoon. Lineman Dennis Reilly blocked a Tigers punt in the first quarter and Brad Clarke ran the ball back 28 yards to give SU a 10-2 (LSU tackled Little in the end zone for a safety) advantage, but those 10 points would end up being all the SU scoring for the day, and Nance (70) and Little (48) combined for only 118 yards rushing as the game flipped on the Tigers turning up their defense in the second half. On the first possession in the third quarter the game’s star, LSU wide receiver and kicker Doug Moreau, came out of the huddle on a first down play and flanked out as the only receiver in formation. He promptly raced by the Syracuse secondary and hauled in a beautifully thrown 57 yard pass for a touchdown. The subsequent two point conversion, a short pass play at the goal line, tied the game at 10-10 and had the 99.9 percent of the 60,000 fans on hand rooting for the home state team getting enthusiastic. The Orangemen had one long drive in the fourth quarter that was halted by an interception at the LSU 22, and the Tigers came back down the field and settled for a 28 yard field goal by Moreau with just under 4:00 to play for the eventual game-deciding points in the 13-10 victory. Another side note to the game: Moreau’s winning field goal was his 14th (in 22 attempts) of the season, but back then bowl game statistics didn’t count towards season totals. None-the-less Moreau’s 13 field goals in 1964 set a NCAA season record, and more noteworthy set in motion 54 seasons ago the importance of field goal kicking to become an integral part of the game’s offensive strategy among coaches.